Can't decide whether to play in the garden or work inside? Let the daisy decide! Maybe it's because Henry was born in April, when spring fever hits hard and gardeners everywhere get itchy to be out digging. 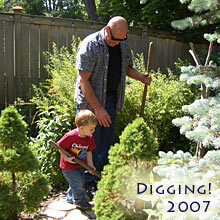 He has always loved helping in the garden and watering plants. Now his little brother, Oliver, also shows an interest (see video below). Or maybe it's just that every child loves playing with water! 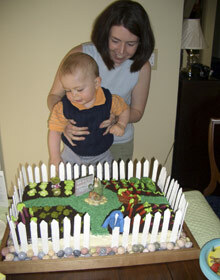 Here is Henry's first birthday party with his garden cake (made by me but inspired by Martha Stewart and Beatrix Potter!) One layer of carrot cake and one layer of zucchini cake—Peter Rabbit would have loved it! Henry never skips an opportunity to help in the garden, as shown above digging with Laif. 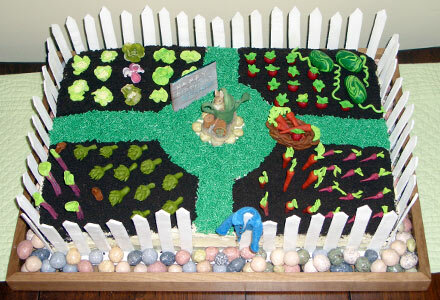 His recent fourth birthday party (2009) also had a garden theme. 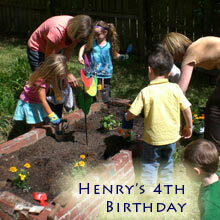 Above right, party guests help Henry plant his birthday garden. Below, Oliver demonstrates his ability to help in the garden too! This video requires Adobe Flash. Be sure of trouble-free viewing by downloading the latest version. It's free of charge and only takes a minute or two to install. Click here to install it now.